Please tell us about the history of your band and its members. Nierty began as a one man side project in 2006. at the time i(skaven) was writing for an epic blackened doom band that began between me and my compadre, i wanted to focus on more terrifying riffcraft and break away from the musical restrictions i was working in and experiment in a more open project my idea was to make some EPs that suited my own taste with as much distortion and chaos as i wanted and then i would like it, that idea was nierty. 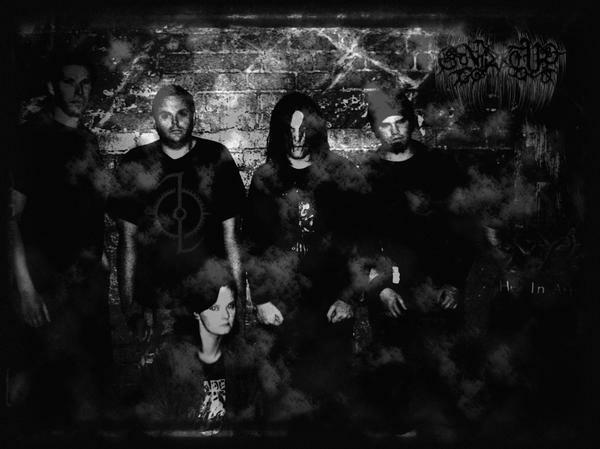 it was about 3 years of honing this before hecate enthroned's dylan and dean seddon caught on to what i was trying to do and stepped in to help make it a living breathing band which later grew to the 5 piece blackened death grind outfit it is today. How would you describe your style? Which bands influenced your music? listening back to our music i would probably discribe it as semi Industrial blackened death grind with significant elements of doom and suicidal black metal but for me it is simply metal as i dont write to cater for any genre, that would be selling out and i dont care for that at all. Why should a metalhead buy your demos/albums? They shouldn't, its all free to download, theres only 2 reasons anyone should be compelled to buy a CD and thats to have a hard copy either because they have little care or understanding of musical formats of anything beyond a CD player or if they catch us at a gig and there actualy fucked up enough to understand and appreciate our art form. though saying this funds from our record sales all go towards recording so if anyone who enjoys our music enough to download it wishes for an improved production on the next record then ordering our CDs our donating through misantrof is going to make that happen we dont give to recieve thats the way all humans should think but if you only take, then realy your just taking from yourself. What have you released so far and how were your releases received by the public/media? So far we have released 5 EPs one of which was re-released as an album as part of a special trillogy of free albums by the time this interview is published, these are Maniacal Laughter, Diametrical Infarcations, Dominion, Essence Of The Nightbringer, Fed To Rats, Redemption Denied(sub ep of Fed To Rats) and Acolytes Of The Descent. i have no idea how these albums were generaly recieved beyond comments and messages which have to be seen to be believed, surficed to say im yet to realise my life long ambition of ensighting a linch mob over the the sheer hostility in my music but i perservere. Do you play live as well? How's your live activity so far? To be brutaly honest shows have been a new experience to me and honing the stage show has been difficult to develope mastering our sound and presence has been pretty much up hill though emensely enjoyable and usualy quite triuphant and given me a new found respect for any band that pulls off a good'n but with new members and a long break to hone an all new set and show we cant wait to get back on the stage and lay waist to any crowd. What should labels/zines/promoters know about your band? Why should they be interested in it? Labels are of no consiquence to us, were not out to make an easy penny, though zine interest is always welcome and rewarding but what is important to know is the message of contempt we have for humanity and this is deeply embedded in our art, we work everyday to spread this affliction, and as a consiquence for our disregard for the industrie, the general music scene, or anyone else nierty now has endevoured the potential of one of the most violant shows in the world both musicaly and visualy. What plans do you have for the near future as a band? At the moment were begining to experiment with more symphonic aspects of our current sound and focus more in black metal territory but nothing is ever certain in the future of this band youl have to wait and see. Where can we listen to your band and where can we buy your stuff? Anything can be directly ordered from our myspace websight and funnily enough our music is there to, by the time this interview is published our misantrof page will be up and running where our whole album can be heard and downloaded free just like our other albums. if your unsure use google because in all honesty, were everywere!